Old Hunstanton Village01485 532610work VillageOld Hunstanton is a village settlement adjacent to the larger resort of Hunstanton or New Hunstanton. The quiet character of Old Hunstanton remains distinct from and complements that of its busy sibling, with clifftop walks along the famous stripped cliffs past the Old Hunstanton Lighthouse and the ruins of St Edmund’s 's Chapel, built in 1272. King Edmund supposedly built the village. The River Hun runs to the coast just to the east of old Hunstanton. Old Hunstanton is also near the start of the Norfolk Coast path which extends over 40 miles along the stunning coast. 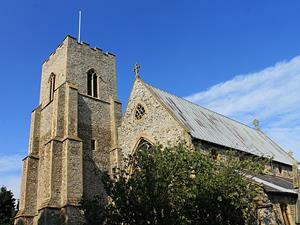 The parish church of St Mary, situated in the grounds of Hunstanton Hall, is a Grade I listed building. It was built by Sir Hamon le Strange in about 1300 and extensively rebuilt and restored during the 19th century for Henry Le Strange (1815- 1862), developer of New Hunstanton. At Old Hunstanton is an RNLI Lifeboat station with a B class (Atlantic) boat and a Hovercraft. Pine trees, dunes and beach huts separate the village from the wonderful beach. In the village itself there are shops a craft centre, restaurants and two pubs The Ancient Mariner and The Lodge. Old Hunstanton is a village settlement adjacent to the larger resort of Hunstanton or New Hunstanton. The quiet character of Old Hunstanton remains distinct from and complements that of its busy sibling, with clifftop walks along the famous stripped cliffs past the Old Hunstanton Lighthouse and the ruins of St Edmund’s 's Chapel, built in 1272. King Edmund supposedly built the village. The River Hun runs to the coast just to the east of old Hunstanton. Old Hunstanton is also near the start of the Norfolk Coast path which extends over 40 miles along the stunning coast. Old Hunstanton is also home to Hunstanton Golf club with its renowned links course which follows the coast north from the village.